The present canvas is signed and dated “Jusepe de Ribera español 1633” on the stone at the lower right corner, a formula used by the artist throughout the 1630s and to which on occasions he added his place of origin, “valenciano”. The canvas dates from one of Ribera’s most creative periods with regard to the quality and number of works emerging from his studio. This was the decade of the group of paintings for the Augustinean Recollect convent at Monterrey, produced between 1633 and 1637; the series of Philosophers of 1636, commissioned by the Prince of Liechtenstein (now divided between various collections); the decoration of the Charterhouse of San Martino of 1637–38; mythological paintings such as Apollo and Marsyas of 1637 (Museo Nazionale di San Martino); and religious compositions such as Jacob’s Blessing of 1637, and Jacob’s Dream of 1639 (both Museo del Prado, Madrid). In the 1630s Ribera’s style underwent a transformation and he began to work with a lighter palette, using the Neo-Venetian approach to colour that had extended from Rome to Naples. His figures, however, continue to be constructed using a powerful, three-dimensional modelling and pronounced contrasts of light of varying intensity depending on the subject. The change evident in his use of colour was probably influenced by the presence in Naples of works by Flemish painters such as Rubens and Van Dyck and by the work of artists such as Pietro Novelli, who was familiar with the work of Van Dyck and of Giovanni Lanfranco. The Pietà can be ascribed to a transitional period in Ribera’s work in which he had not yet abandoned his use of a tenebrist style of lighting but in which a new interest in colour is evident. The canvas, which was in the collection of the marqués de Heredia, depicts a subject that Ribera painted with numerous variations throughout his life. The oldest reference to a Pietà by Ribera is to be found in an account by Giulio Mancini, who mentions a “Christo deposto” among the works executed by the artist in Rome. It was commissioned by an unknown Spaniard who is thought to have been a diplomat or merchant. The earliest surviving Pietà by Ribera relates to one of the earliest commissions that the artist received in Naples from Marcantonio Doria and is considered almost certainly to be the painting now in the National Gallery in London. In that work, which is of horizontal format and dates to around 1620, Ribera places the dead Christ in the foreground at the moment when Saint John lays him on the shroud, accompanied by the Virgin and the Magdalen. The Burial of Christ in the Louvre is dated to the late 1620s. It is tenebrist in style and the figures accompanying Christ bend towards him in a highly expressive manner. 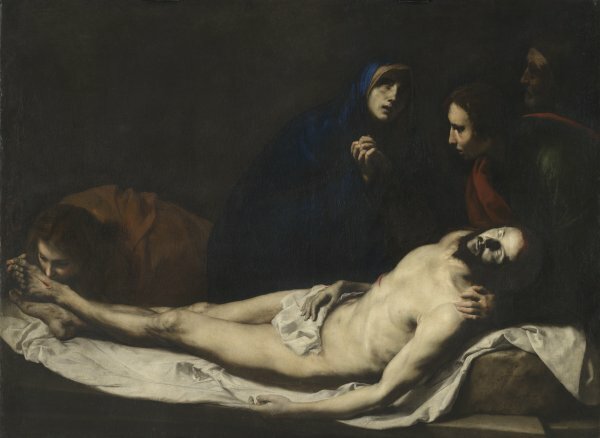 In the 1630s Ribera produced two masterpieces on this subject, namely the Pietà for the convent of the Augustinean Recollect nuns of Monterrey, Salamanca, of 1634, and the Lament over the dead Christ for the Charterhouse of San Martino, Naples, of 1637, which can be compared to the present canvas. This similarity is evident in the repetition of the models of the Magdalen and Saint John although they are posed differently in the two canvases due to the different formats of the compositions. In the painting in Naples the compact central group is arranged around the pronounced diagonal formed by Christ’s body, while in the present Pietà the figures are arranged along the width of the canvas, although still in relation to the body of Christ. Nothing is known regarding the client who commissioned the present canvas, although it has been assumed that it was a Spaniard. 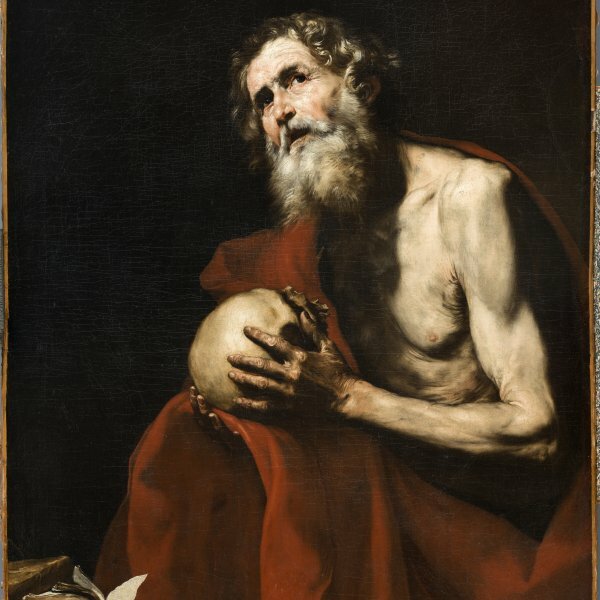 Ribera’s canvas is created through an energetic type of brushstroke and is selectively illuminated, a device that undoubtedly contributes to emphasising the spiritual message of the work in an emotional and expressive manner. Ribera also brilliantly conveys a sense of physical pain through Christ’s open wounds, particularly the one on his side, as well as the suffering and anguish reflected in the Virgin’s face and hands. This Pietà is a unique composition within Ribera’s oeuvre and one not known through any versions or copies.